Dahlia Barr does not suffer fools - or her own government, with which she is normally at odds. Shrewd, brash, and as tough as she is beautiful, the controversial Israeli attorney specializes in defending Palestinians accused of terrorism. She is also a devoted mother, a soon-to-be-divorced wife, and the lover of a handsome American television correspondent. To Dahlia’s astonishment, the Israeli security establishment one day approaches her with a tantalizing proposition: Join us, and become the beleaguered nation’s arbiter on when to use the harshest of interrogation methods - what some would call torture. Dahlia is intrigued. She has no intention of permitting torture. Can she change the system from within? Then, as Dahlia settles into her new job, her son Ari, a 20-year-old lieutenant in the Israel Defense Forces, is kidnapped by Hezbollah and whisked over the border to Lebanon. The one man who may hold the key to Ari's rescue is locked in a cell in police headquarters. Edward Al-Masri - professor, activist, media gadfly - is an Arab who has a long and complicated history with Dahlia. And he's not talking. Yet. 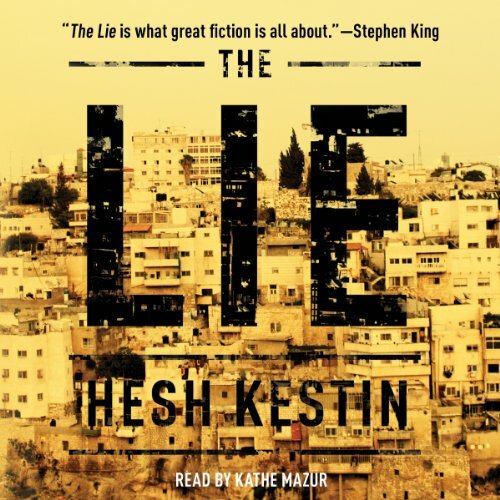 The Lie is a nail-biting thriller, pulsing with insight into the inner workings of Israel’s security apparatus. It is an unforgettable story of human beings on both sides of the terror equation whose lives turn out to share more in common than they - and the listener - could ever have imagined. An Israeli human rights lawyer who argues on behalf of Arab residents is given the job of approving who, when and how the government tortures. Meanwhile, her son is kidnapped by Muslim terrorists. Nice set up, bad execution. There's a twist that's obvious from the first page and has been done better before. Maybe if the story had STARTED with that twist ... Also problematic is how the lawyer casually tosses aside her ethical beliefs and life's work without much consideration. The characters are mostly shrill caricatures: dirty, lying, murderous, Jew-hating Muslims; lying, murderous, Muslim-hating Jews who nonetheless must do what they do because they are on the side of angels against evil; liberal, nonsensical hypocrite Jews who protest on behalf of Arabs; and a loving, generous old Arab woman who plays a woman-of-color Mammy character. There's also a thriller rescue plot that is tension free. The only good thing about the book is its interesting details of the Israeli security state. Bechdel test: pass.